Following Joseph Pilates’ philosophy to “Never fail to get all the sunshine and fresh air you can” ‘and work in the water’, Jennifer Stacey, MS created the Immersion™ Pilates Aquatics™ School to educate teachers on teaching the Classic Pilates repertoire in the water, using a patented device she invented. It is fun, challenging and supportive! 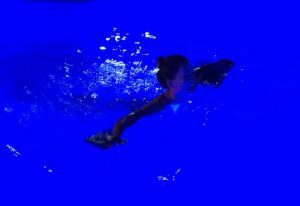 The wiggle of the water adds an extra proprioceptive challenge that makes you instantly access the centers. 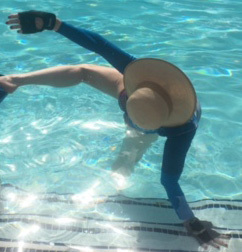 The support of the water allows you to learn the advanced repertoire earlier, even if you have injuries. IPA™ deepens your understanding and cueing of Pilates. 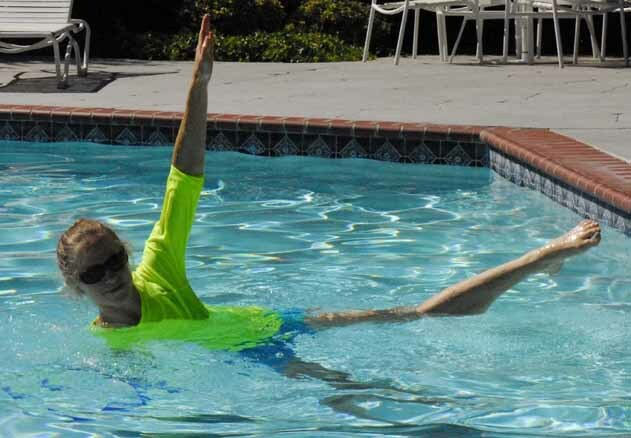 Learn the images, cues and wisdom of the Pilates Elders. Imagine carrying the entire line of Pilates’ apparatus in a backpack and performing the Classic Repertoire in the sunshine? It is exhilarating being able to perform the entire advanced Classic Pilates work, while challenging the center and supporting the body (it is appropriate for beginners and people with injuries as well). We were introduced in Pilates Style Magazine July/August, 2016 edition! 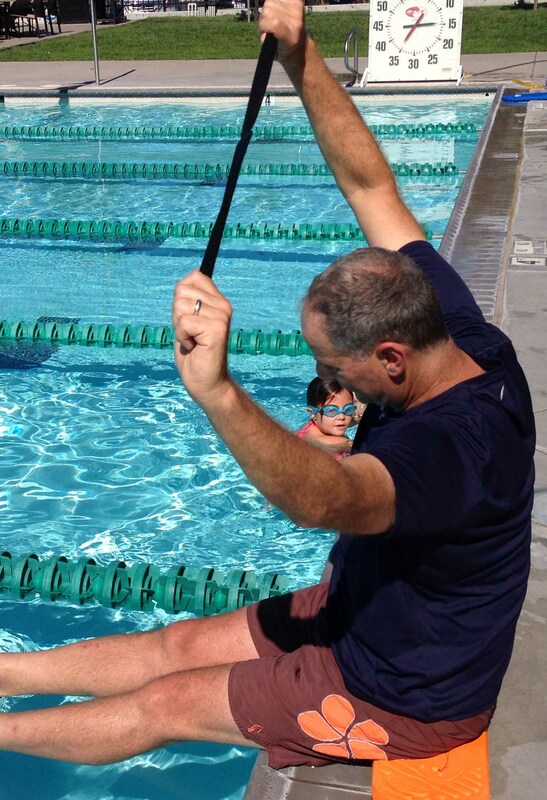 “I feel IPA™ will be the future of water exercise or at least a wonderful addition to fitness in the water.” RH, General Manager, Moraga Country Club. Exciting news! Jennifer M. Stacey, MS, 2nd generation Pilates Teacher, is returning to Europe. 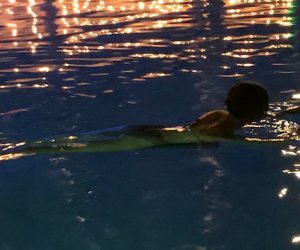 There are several Pilates Workshops, Sessions and a Immersion™ Pilates Aquatics™ Course planned for Rome, Italy. 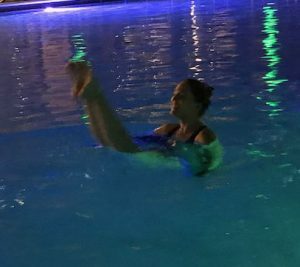 Immersion™ Pilates Aquatics™ course. July 12 – 14, Rome, Italy! Rome Forum Sports Center. 18 PMA CECs. Jennifer will also be teaching Pilates Studio workshops and sessions in Rome July 7, 10, 11 and other dates. Stay tuned! 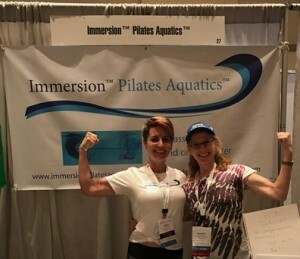 Immersion™ Pilates Aquatics™. Moraga, California. May 31 – June 2. 10 am – 5 pm. (and October). 18 pMA CECs. Sign up early, space is limited in all IPA™ courses (6 (Moraga) – 10 (Rome) people maximum). 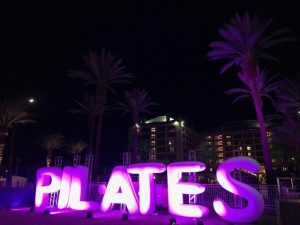 The course reviews the following: a Movement Perspectives™ lecture, and Pilates in, on or above the water, approximately: 5-6 hours each of The Reformer, Mat, and Chairs Repertoire, 2 hours of Cadillac repertoire, Ped-u-pol, Barrels, etc. 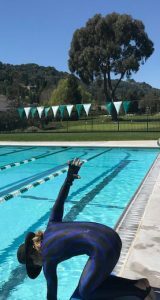 Moraga: $750 plus pool fee ($10 per day (rate subject to change) for large pool. 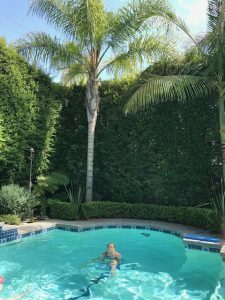 No fee for small pool.). Rome, Italy price $860 (includes 3 day pool fee). Includes: comprehensive, detailed manual ($90 value), workout cards, coaching, support and more. Discounts on the IPA™ board kit, supplies and Peak Performance Pilates manuals. 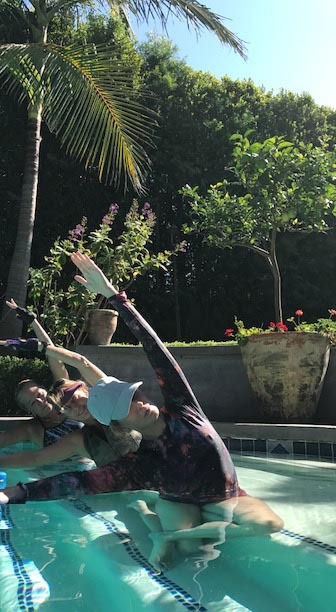 Learn how to safely perform and teach each Pilates skill, plus the following: Movement Perspectives™, Performance, Biomechanics Modification, Variations, Sequencing, Transitions, Levels, Benefits, Challenges specific to water, Contra-indications. 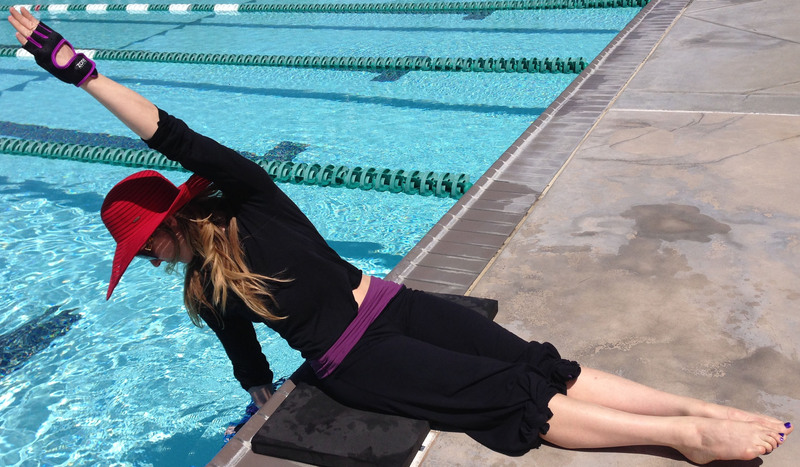 Similarities and differences with the Pilates apparatus vs water, Spotting each skill. Cues and skills from the Pilates Master Elders. Becoming a licensed IPA™ teacher includes education support, free continuing education, advertising and advertising materials, referrals, support and the joy of teaching Pilates in the water! There will also be an abbreviated course for Physical Therapists and Fitness professionals. Shirley Archer (Pilates Teacher) wrote an article for IDEA Fitness Journal in May 2017: Water Fitness: The Science behind the Splash. P. 36 – 44. She states several studies. “Experts agree that water fitness is positioned for significant growth owing to changing demographics, improved equipment options and greater public awareness.” “A new era of water fitness is here.” “Mounting research on the benefits of Aquatics Exercise supporting the claim that it helps people of all ages and ability levels.” Aquatics Exercise had one of the highest spikes in the fitness industry in 2018. If you would like to take an IPA™ class, the following teachers are available to teach you: San Francisco – Quilet Rarang; in Oakland – Alicia Ricci; in Moraga – Jennifer Stacey, MS. Wisconsin: Susan Whipp. Marta Serra Marti, Faye Stevenson, Vanessa Lind, Gaby Diskin in the East Bay. Kathryn Peters, Lelia Parma, and soon Eleanor Singleton in Los Angeles. 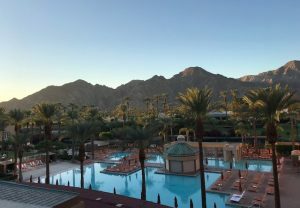 Carrie Fields in Arizona. Jennifer is offering classes in Moraga on Fridays and Sundays. Please contact Jennifer if you are interested in attending an IPA™ class. Pre-requisites for the full IPA™ course: 1-3 years of Teaching Classic Pilates on all apparatus. Comprehensive Pilates Certificate of completion. It is presumed the teacher fully understands the complete system that Joseph and Clara Pilates designed. Anatomy, biomechanics, kinesiology aptitude. 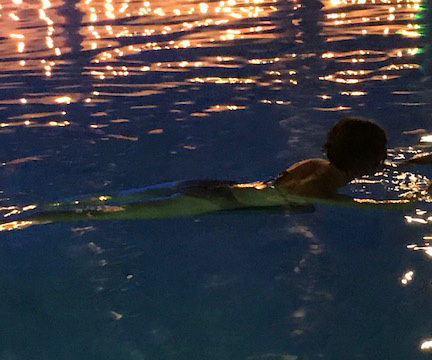 Swimming aptitude. 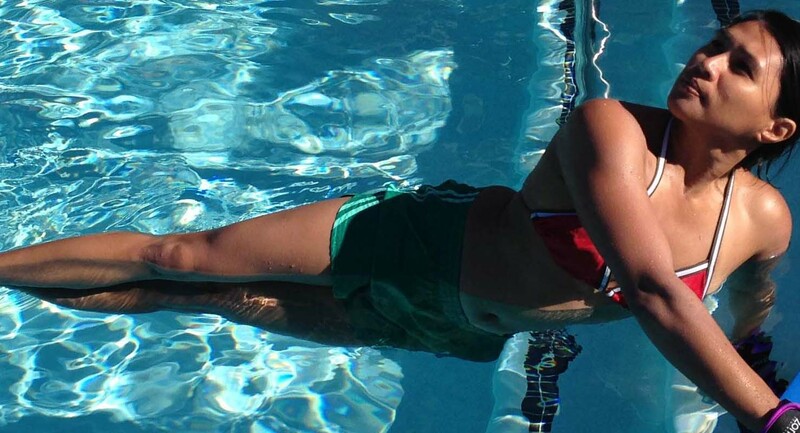 Water Safety (Red Cross offers short online courses), CPR certification. We will have Booth 9 at The Pilates Method Alliance Conference in Monterey, CA Oct., 2019. See you there! 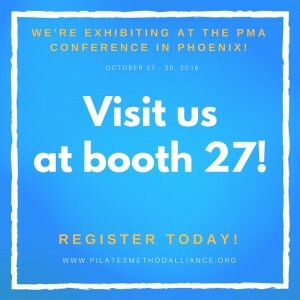 We will be offering an IPA™ course prior to or following the PMA conference. 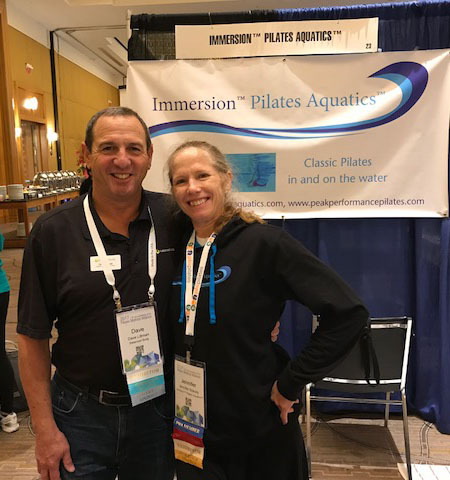 Immersion™ Pilates Aquatics™ FUN in Helsinki, Finland in October, 2018 at the Scandic Hotel at IADMS. 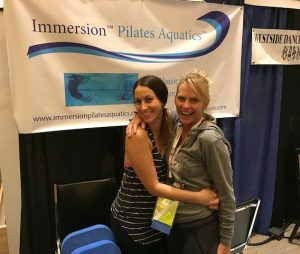 Immersion™ Pilates Aquatics™ FUN at the Pilates Method Alliance Conference in Indian Wells! Thank you Marta for your fantastic teaching and work. 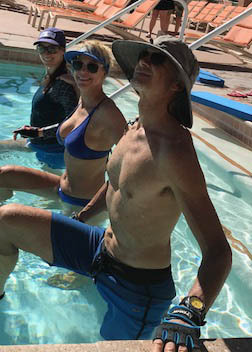 Thank you everyone for playing (and laughing) in the pool. Thank you for all who attended my workshop Stretch or Squish, and demonstrators Katya and Junko. See our beautiful “office” below. 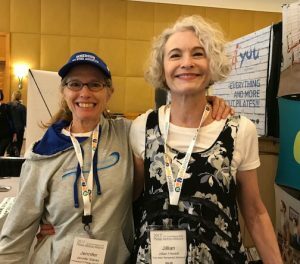 We were excited to share Booth 23 with the revered Marika Molnar ( her Parasetter(r)) at the PMA conference in Indian Wells, CA in October, 2017. 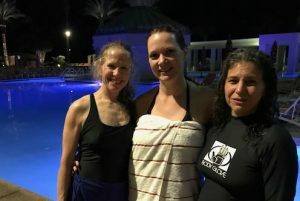 Many wonderful people had a Free IPA session at the PMA conference pool! 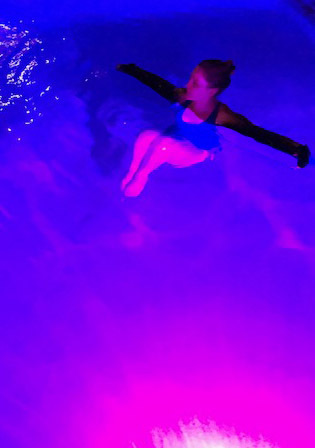 We closed the pool out at 11:15 pm! 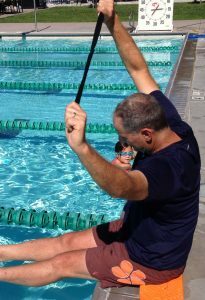 Pilates Aquatics was full of “Aha!” moments for me. 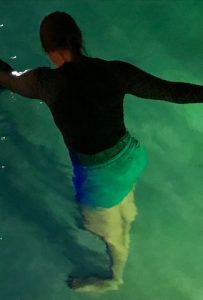 Doing Pilates in the water provided a slight shift in physics that allowed me to immediately feel the work in a deep way. 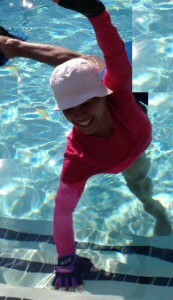 The exercises felt very accessible, and working out in a pool setting is brilliantly energizing! We are introduced in the July/August, 2016 edition of Pilates Style Magazine. A full feature expected in the future! I am trying to get moe info but the info link you shared says error. Please email me with more info for the Moraga classes with Jennifer Stacey in May. I apologize about the problem. 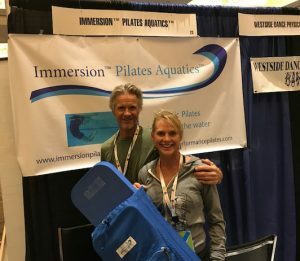 Thank you for your interest in Immersion(tm) Pilates Aquatics(tm). I will email you. Thank you. Thank you of your interest in Immersion(tm) Pilates Aquatics(tm). I have emailed you a few days ago. Thank you!